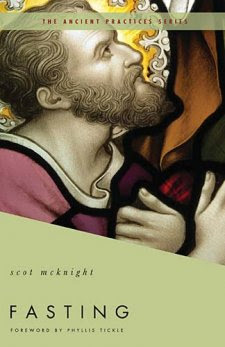 In this book, Mr. McKnight discusses the topic of fasting and emphasizes how it is radically misused and abused in the modern day. Not only is it a rarely practiced act, but when it is practiced it is often done in a misinformed way. Mr. McKnight discusses how many Christians have disconnected the body from the soul. In other words, Christians see themselves as two entities - there's the sinful, flesh-filled body that desires after nothing but sin and then there's the spiritual side that seeks the things of above. Mr. McKnight argues that until we reconnect these two "parts" we will neither be practicing fasting properly nor will we receive the full benefits from this practice. Mr. McKnight emphasizes that fasting should not be done as an attempt to manipulate God into giving us what we want. Rather, "fasting is a response to a sacred moment." With this I wholeheartedly agree. We sin. Our response to this grevious act could naturally be fasting. We come to the realization of a blessing we have received by God, we fast as a natural response to His goodness. We recognize our nation's sin and are grieved by it, therefore we fast. Mr. McKnight does a pretty thorough job of looking at the various types of fasting. He also makes it a point to distinguish the difference between fasting and abstinence, something that the modern church is often confused about. Honestly, I have been dreading writing this review. This was one of those books that was okay. And Mr. McKnight had some really good points that I completely agreed with, particularly that fasting should not be an instrument to get what we think we want. However, at times this book felt very flat and superficial. There were times when I just felt that the writing lacked the Spirit. It was more about an act, a tradition, a practice rather than a Spirit-led conviction. But then other times, I felt like Mr. McKnight offered some very solid, Biblical direction and wisdom. And so, I'm left somewhat confused over this book. It was a good book for getting a brief overlook at the ancient Orthodox church's practice of fasting, and it did a very thorough job of describing the different types of fasting that we should practice. However, as I already stated, at times I felt disappointed because the book felt very dry and rigid. I am left with more knowledge over the history of fasting. And this book has reinforced the point that fasting is a response to a sacred moment. However, this is probably not a book I would excitedly recommend to a fellow believer. Thomas Nelson, Inc. sent me this book in exchange for my honest review. thanks for the review, amber. i have been looking for more information about fasting. it looks like this is not the book for me!